A CBC Marketplace investigation has uncovered potentially dangerous levels of filth and contamination in hotel rooms across the country. In the largest-ever survey of Canadian hotel cleanliness, Marketplace tested thousands of individual spots inside hotel rooms at a wide spectrum of chains in Montreal, Vancouver and Toronto. More than 800 "high-touch" spots were tested in 54 rooms at six hotel chains, including budget hotels EconoLodge and Super 8, mid-range hotels Best Western and Holiday Inn and the luxurious Fairmont and Sheraton. Scientific analysis found high levels of contamination creating potentially hazardous conditions for guests. University of Guelph microbiologist Keith Warriner conducted the tests for Marketplace and found alarming results. "I wasn’t expecting [bacteria] to be so prolific," he said. "I was really surprised at the lack of sanitation. [Maids] make it look nice, but [they’re] not making it sanitary, which is totally different." 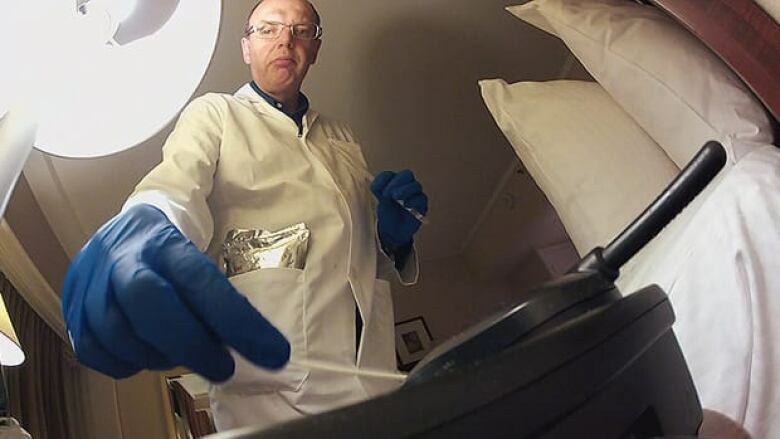 Warriner tested common "hot spots" in hotel rooms using an adenosine triphosphate (ATP) measuring device that determines microbial contamination on surfaces. A scan of any surface gauges the level of contamination with a simple numerical value, employing a scale used in similar tests in schools and offices. An ATP level under 300 is considered a "pass," while anything between 300 and 999 is in considered to be in the "caution zone." An ATP level over 1,000 is deemed a fail. Marketplace’s test found that bed comforters, bathroom faucets and TV remotes were the top three dirtiest spots in hotel rooms. Comforters were the most consistently contaminated spot, rating a "fail" in 23 out of 51 tests, or nearly half of the tests. The highest contamination count for a comforter was found at a Super 8 hotel in Montreal with a 26,124 ATP level. Though doctors recommend proper hand washing to protect yourself from illness, faucets in hotel rooms were quite dirty themselves, with 16 fails out of 54, or a failure rate of 30 per cent. The Holiday Inn Toronto Downtown Centre had the highest contamination count for a faucet with an 11, 374 ATP level. Over 70 per cent of remote controls tested were rated a caution or fail. The highest contamination count for a remote came from the Fairmont Hotel Vancouver, with a 22,292 ATP level. Other major hot spots included bed throws, bathroom sinks, toilet bases and telephones. Bacteria are common in homes but hotels pose a greater threat because the germs come from thousands of strangers, said Warriner. "In a hotel, you've absolutely got no sort of notion of a history," he said. Warriner was shocked at the high levels of contamination revealed in the tests. "I was absolutely amazed to see how high those [ATP] counts were," he said. "They were beyond the sort of limits that you would accept even as a moderately sanitized surface. Those ATP counts, both in the comforters, and all around the hotel to be honest, were very alarming." He says comforters in particular can pose a threat to guests. Watch The Dirt on Hotels, Friday at 8 p.m. (8:30 p.m. in Newfoundland and Labrador) as Marketplace reveals the risks you don't see - and what you can do about them. "When we step into a bed, we're exposing our bodies to it," he said. "And we're there for a long time." "This poor comforter is getting exposed to all these different people, depositing their microbes down, and you're just acquiring theirs. So it's a significant transfer route." Intimate exposure to highly contaminated areas like in a bed or on a toilet seat, is particularly dangerous, he warned, as it could lead in rare cases to myriad illnesses including urinary tract infections or sexually transmitted diseases. Warriner also used an ultraviolet light to search for stains otherwise invisible to the naked eye. Used in rooms that otherwise appeared clean, he discovered stains he said could be either from urine or beer, a coffeemaker covered in so much organic material that it appeared not to have been cleaned at all and a pillow with so much bacteria it has "its own life story." "There's every chance that [guests] do get sick," he said. "It's just that they don't realize it's the hotel bed they were sleeping on. "It just goes to illustrate that looks are deceiving," he added. Warriner was also surprised that high-end hotels were no cleaner than budget ones. Budget hotel Super 8 had among the cleanest bathrooms in the study, Warriner said. "The top-end hotels, they all really performed equally as bad," he said. A Montreal Best Western had among the overall best results, whereas some of the dirtiest bathroom surfaces were found in Fairmont rooms. "If you're going to pay the extra money for a top-end hotel, don't expect to have better sanitation," he added. Overburdened hotel staff is the main reason that many rooms are so filthy, says longtime hotel housekeeper Brigida Ruiz. Ruiz, who has worked at the Toronto Sheraton Centre for 21 years, says housekeepers have an extensive task list for cleaning each room, but rarely have enough time to complete it. Canada’s hotel union tries to enforce a cap 15 to 16 rooms cleaned per shift, giving staff approximately 30 minutes per room. Ruiz says that isn’t enough. At that rate, Ruiz says she can't complete her list of required tasks. "I wouldn't finish the 16 rooms perfectly because there's so many steps that you need to follow," said Ruiz in reference to the required task list. "If they want it to be spotless, that will take so much time." She said many housekeepers work unpaid overtime to reach their daily targets, but many still use time-saving "shortcuts" like not dusting or vacuuming. The way to ensure well-cleaned rooms is for management to relax its demands, she says. "My argument is that I say, ‘You have to give us less rooms,’ she said. "That's not going to happen." In response to the Marketplace tests, Starwood Hotels, which owns the Sheraton chain, replied with a statement saying it is "taking [Marketplace's] findings very seriously" and pledged to order extensive re-training and review of its cleaning policies. Holiday Inn parent company InterContinental Hotels Group also replied with an email saying, in part, "the health, safety and comfort of guests at all IHG hotels are important to us" and that it would investigate any reports of non-compliance.